Said otherwise, suddenly nobody wants to be short the short end. Why? According to McGeever, two factors will have figured in the decision of hedge funds and other speculators to cut their short positions in U.S. bond futures: high yields and the explosion of volatility earlier this month. Indeed, aside from the abovementioned risk of an emergency easing move by the Fed (both JPM and BofA said that the market crash after the VIXplosion was violent enough to prompt a central bank intervention) which could send short-yield plunging, the recent surge in yields - the two-year yield hit its highest since Sept. 2008, the five-year yield its highest in eight years and the 10-year yield its highest in four years - has sent a mountain of money away from longer maturities, and into ultra-short dated fixed income instruments. 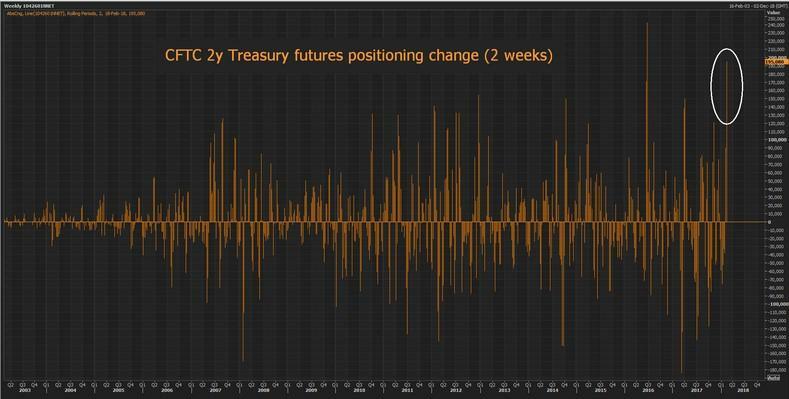 It wasn't just the short end that saw a short covering frenzy: net short positions in 5Y bond futures were cut by over 100,000 contracts, the eighth largest weekly reduction in bearish bets on record, and the reduction in net short 10-year futures was the first in four weeks. What is perhaps more surprising that the short covering, is that this time there were no casualties and the move was generally orderly. 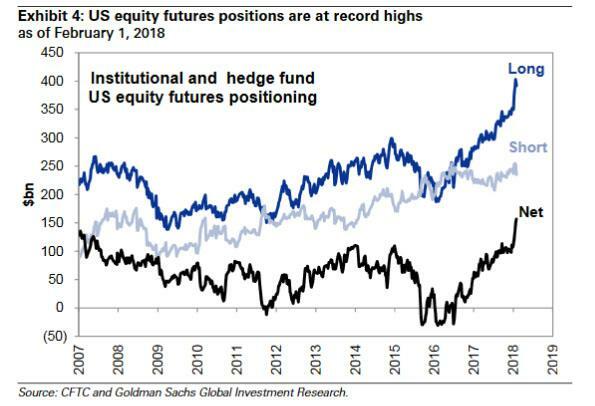 In fact, the surge in market volatility earlier this month provided the perfect opportunity for hedge funds and other speculators to cash in on what have been extremely profitable trades as short positions across the curve had become extremely overloaded: as we showed 2 weeks ago, 2Y and 5Y bond futures net short positions hit a record last month, while bets last week on 10Y bond prices falling were the biggest in a year and close to the largest net short position ever. “From current levels it will take a lot for bond markets to simply keep selling off and we thus remain wary of extrapolating the recent price action into the future,” RBC Capital Markets strategists wrote in a note to clients on Monday. “We have recommended taking some profits on shorts and would currently keep outright exposure limited,” they said. 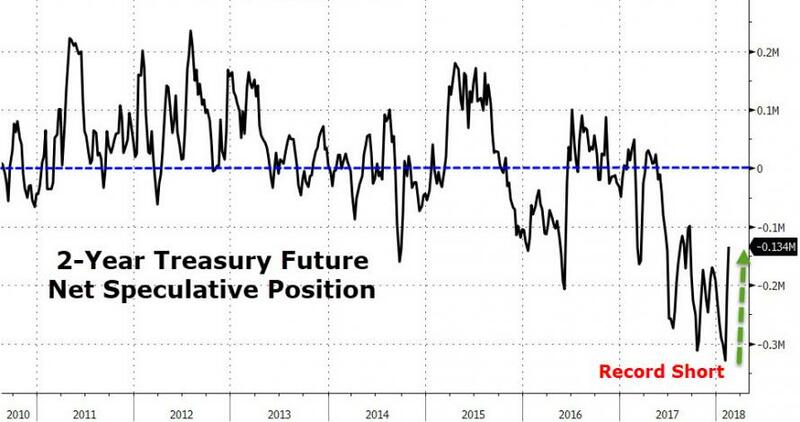 Alternatively, the reduction in shorts, means the probability of a short squeeze is far lower should there be any unexpected "rate" shock in the coming days. And while it may not exactly be unexpected and certainly not a shock, the Treasury Department - facing a historic surge in funding needs - will continue ramping up its debt issuance to fund the expected growth in borrowing thanks to the Trump tax package, which as discussed earlier, prompted Goldman to warn that US fiscal policy could lead to a debt catastrophe if left unchecked. 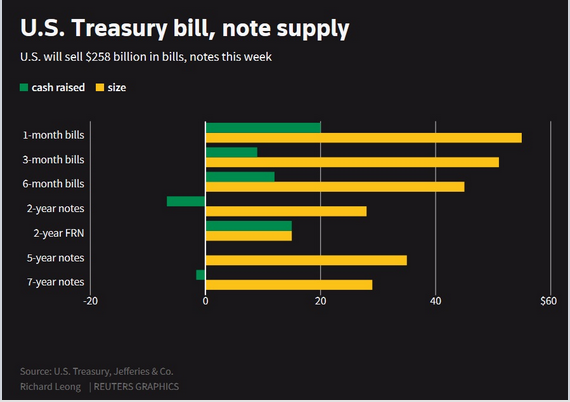 Which brings us to this week, when the US bond market is about to see an unprecedented deluge in bond issuance: after the Monday holiday, Treasury supply will kick off this week on Tuesday with $151 billion worth of bills including record amounts of three-month and six-month T-bills. That's just the beginning, and the rest of the debt sales will be spread over the holiday-shortened week with $28 billion of two-year fixed rate notes on Tuesday; $35 billion in five-year debt on Wednesday and $29 billion in seven-year notes on Thursday. The Treasury also plans to add $15 billion to an older two-year floating-rate issue. All else equal, this surge in new TSY issuance would spook most bond investors, just not this time; perhaps going forward, ahead of every such record issuance week, the Treasury should make sure there is an equal and opposite equity scare, if only to make sure that Goldman, and its concerns about "the continued growth of public debt raising eventual sustainability questions if left unchecked" is not proven correct.